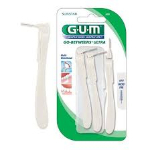 Ideal for cleaning hard-to-reach spaces between teeth and around bridges as well as for people with orthodontic appliances implants or galvanic sensitivity. Antibacterial bristles inhibit bacterial growth so your brush stays cleaner between uses. Nylon filaments and nylon coated wire are comfortable will not scratch implants and will not cause galvanic sensitivity. Brush head adjusts 180 degrees for easy access to all interdental spaces. 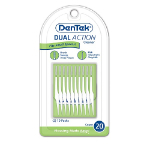 Compact convenient disposable interdental brush is ideal for on-the-go use. Ventilated cap protects brush and can be used as a handle to better reach back interdental spaces.